The Watertown Shootout Reconstructed | Over the line, Smokey! ← The Company You Keep: a review, or a deconstruction. “Those streets in Watertown were the most complex crime scene in the history of the Massachusetts State Police,” Procopio said. Reconstruction of Watertown Shootout. Path of circling officer and location of wounded officer are speculative. Click on image to enlarge. Photo-based diagrams of the explosions near the Boston Marathon finish line were published shortly after the event. However, similar images of the gun battle which took place in Watertown around 12:45 a.m. on Friday have not been available. This post is an attempt to construct a photo-based diagram of that event. This reconstruction is based on various accounts, the cell phone photographs taken by Andrew Kitzenberg and here, and Google maps. Efforts to make sense of the shootout were hampered by early accounts stating that the vehicles came up Laurel Street from the east. Now we know that they came from the west, off Dexter Avenue. The position of the photographer was the second and third floors of the house marked as “cell phone.” The Honda Civic was in the lead, followed by the black Mercedes SUV, followed by the Watertown police car driven by policeman Joe Reynolds, followed by John MacLellan in the second police car. This reconstruction shows the vehicle locations during the initial shooting; they were all pointed east when they stopped, as indicated by the arrows associated with each car. The empty second police vehicle was subsequently pushed away by MacLellan, and rolled downhill to the vicinity of the brothers, coming to rest almost in front of the cell phone house. In all, five to seven policemen were involved in the shootout; Sgt. Jeff Pugliese, Officer Miguel Colon, Officer Richard Donohue, and Officer Timothy Menton are listed as others. State Police Officer Chris Dumont may have also been involved; a number of officers appeared as the gun battle ended. The white circular route of Sgt. Pugliese and the location of the wounded officer (Officer Donohue) are speculative. The location of the pressure cooker “bomb” explosion is shown, but the locations of the three pipe bomb explosions are not known by us. Officer MacLellan rolled his vehicle toward the brothers, and it is assumed that they were targeting this empty vehicle with the pressure cooker bomb and possibly also the pipe bombs. The identity of the man who was firing a pistol at police and later died is known to have been Tamerlan Tsarnaev. The man with him (who escaped in the SUV and was later captured) is alleged to be his brother, Dzhokhar Tsarnaev. View from the approximate position of the police. Tamerlan’s charge creates angled close-range police shots, some of which struck houses. Surely no one can blame the officers for firing at him as he charged them. Al the police took down the wounded Tamerlan, Dzhokhar drove the SUV, in reverse, over his brother, dragging him some 30 feet. The vehicle passed between the police cars, and leaving the scene (“A”), and continuing west across School onto Spruce, and out of sight. Dzhokhar, who was bleeding, abandoned the SUV at the location marked “B”. He then traveled on foot some 4 blocks to location “C”, where he hid in a boat. An all-day house-to-house search by the police somehow did not include all the houses on this street. Dzokhar would later be found by the owner of the boat, who saw that the covering had been disrupted. Why did the brothers stop on Laurel when they realized they were being followed by a police car? Had they continued in two vehicles, and split up, it seems possible that at least one of them might have escaped. One might guess that they thought they might be able to kill the one police officer on scene at the time, as they had killed the MIT policeman earlier, in an attempt to obtain a second pistol. 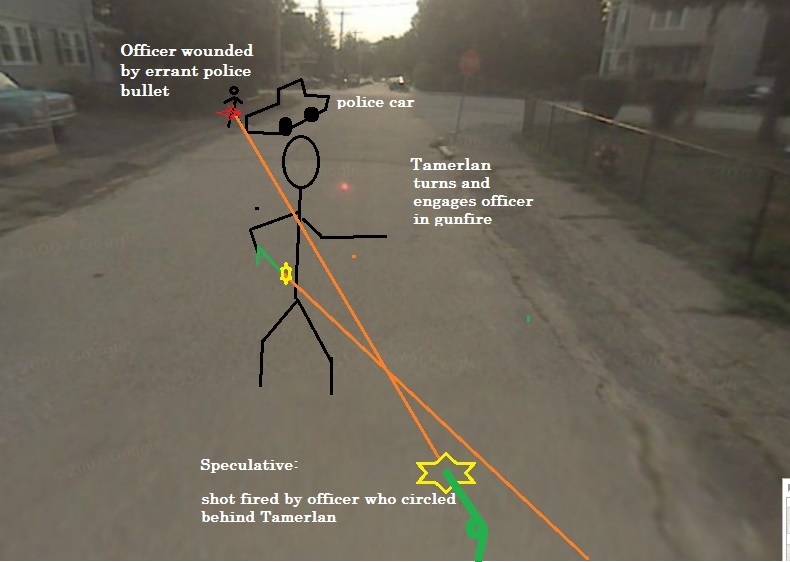 Why did Tamerlan “charge” the armed policemen (there were several by that time) in plain view? He may have been suicidal at that point. Perhaps there was a desperate plan for him to draw the fire, while Dzhokhar escaped. 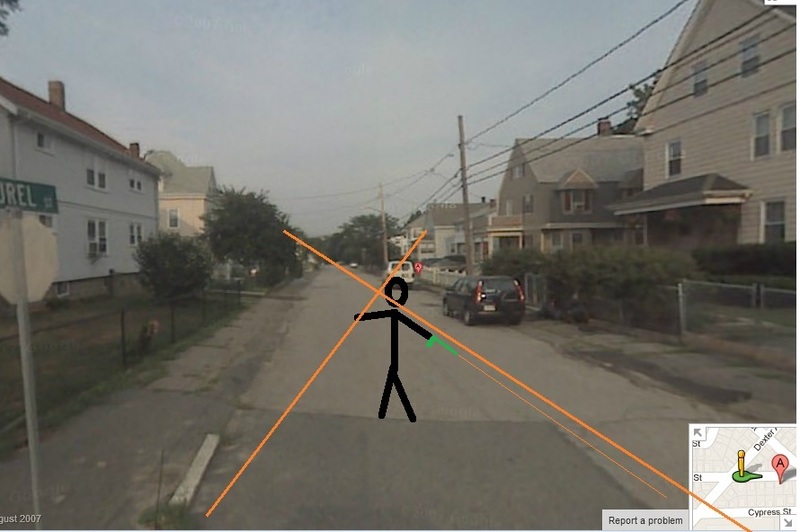 Why did Dzhokhar drive in reverse, rather than forward, east on Laurel? Conceivably he put the vehicle in reverse by mistake. Perhaps he was following the “Demolition Derby” tactic of smashing into cars with the less critical back of the vehicle. Perhaps the other end of Laurel was blocked by police at that time. >Looking west toward police cars: speculative; possible angle of “friendly fire” from police officer who had circled behind the charging Tamerlan and was exchanging gunfire with him. How, in 12 hours, could authorities have failed to search the location where Dzhokar was found, and then sounded the “all clear”? the boat was only four blocks and 1000 feet from where he had emerged, bleeding, from the SUV. Blood trail? tracking dog? common sense? Hundreds of police officers….What happened here? Seriously, this was not good. Nice to read so many differing reports. I think this reconstruction is pretty accurate, if you follow the numbered events. You are making assumptions on their guilt however. I don’t trust anything LE said about what happened. Even piks can be shopped. Nope; never wrote they were “guilty’ of anything. If you’re a mind reader you can tell me what I assumed. If you have a problem with the account, show me where it’s wrong. 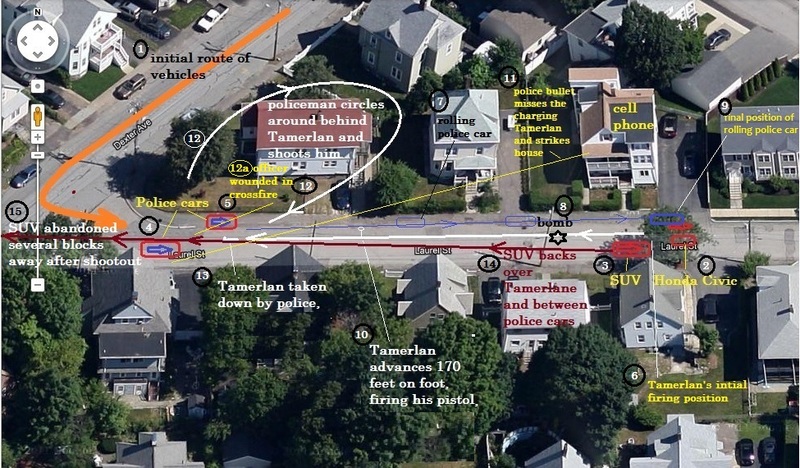 “Al the police took down the wounded Tamerlan, Dzhokhar drove the SUV, in reverse, over his brother, dragging him some 30 feet.” This is reported by the mass media but never verified by anyone else. Check out some more on all this at http://allthingsforum1.blogspot.com/ as I think you will find some matching. I do like the way you have done this. And You are warmly invited to join the discussion in http://whowhatwhy.com/2013/05/23/officer-collier-shooting-rosebud-moment-of-the-boston-bombing/#comments as well! BB has done all the posting on allthingsforum so she gets the credit. But everyone has done the digging and it is amazing. And after reading all of Dave’s site I am not sure there was ever a bombing at all.